It is common to be too tight and focused on details early on. Ironically being LOOSE in the beginning will actually improve the final details in your drawing. ​You do not have to dread the blank sheet of paper in front of you. Here are some ways to help you relax and enjoy drawing. Be loose and very general with your beginning pencil lines, make a soft suggestion of where the eyes and face will be. Remember that all of these soft lines will be covered up with future mark making and shading. So don't worry about messing up. Why? Sometimes a pencil point or line can be too restrictive. Powdered graphite is easier to put down broad, loose, value shapes of darks. Please don't be afraid to get your dark shadows in, because again future marks will go on top. ​No ... the second photo above isn't darker than the photos to the right. You may think I lightened some of the eye area, I didn't. ​What I did was go darker with the eyebrow, lidline, and lashline. It's just an optical illusion. Those darker marks make the values before it look lighter. Have fun and enjoy drawing. Are you interested in drawing tips and classes? For more drawing tips, Sign up for my newsletter to get info sent to you. Starting a new drawing can be very intimidating. Here are three tips to get you started. No details ... at least in the beginning. Details are the fun part, I know. I understand the desire to want to start with them, but save them for later. You need your foundation first. 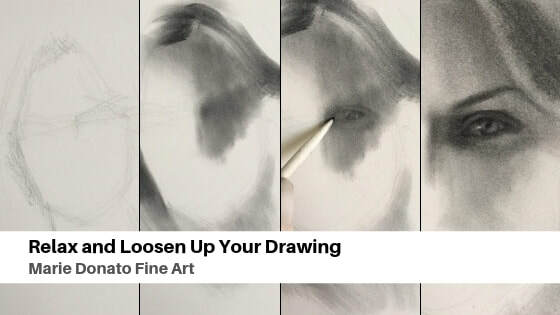 Keep your drawing soft and loose. Step back, LOOK at your subject or photo, and find the overall direction of the figure, and then draw directional lines for a guide. Next, find your largest shapes. Look for circles, ovals, rectangles, whatever shapes you see in your subject. Progress to smaller shapes from there. Draw with a light line using a soft lead pencil. I usually start with a #2 school type pencil or a softer lead, like a 6B drawing pencil. You'll sketch many lines in the beginning because you are exploring your subject and getting to know it. Do not expect to put down the exact marks in the beginning. Be kind to yourself and have fun sketching! Okay 1) Skip the details, at first. 2) Get the overall angle of your figure and identify the largest shapes you see to the smaller ones. 3) Use a soft pencil, very loosely to explore your subject. Subscribe to my Studio Notes, for more drawing tips. 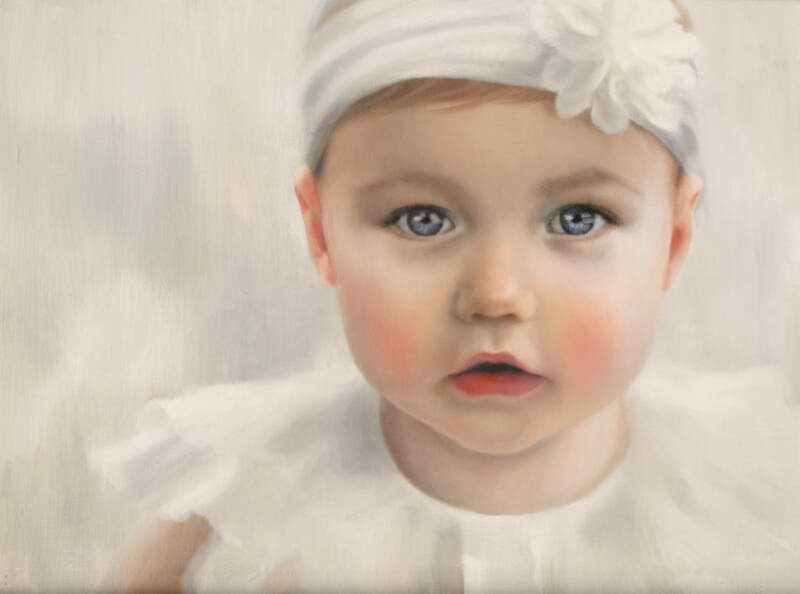 People are often curious as to how a portrait starts and progresses. Sometimes I'll show video clips of a portrait progression on Facebook. I also like to sketch live so that people who might be interested in a portrait can watch a little bit of the process. As part of the team at OA Gallery I have the opportunity, sometimes to sketch while at the gallery. It's a great perk and fun way to catch up on some portrait drawings. Stop by the gallery for a visit. Contact Me to find out when I'll be at the gallery next. What a Fun Art Field Trip! I love our amazing St. Louis Art Museum! It is so beautiful! A favorite thing is to bring my class to the museum to explore and sketch. Our emphasis was sketching the large shapes of the figure in the painting, creating a loose drawing in charcoal and pencil. ​With no pressure, our sketching is done as a form of personal journaling, for each of us to explore and to become more aware of this incredible painting. 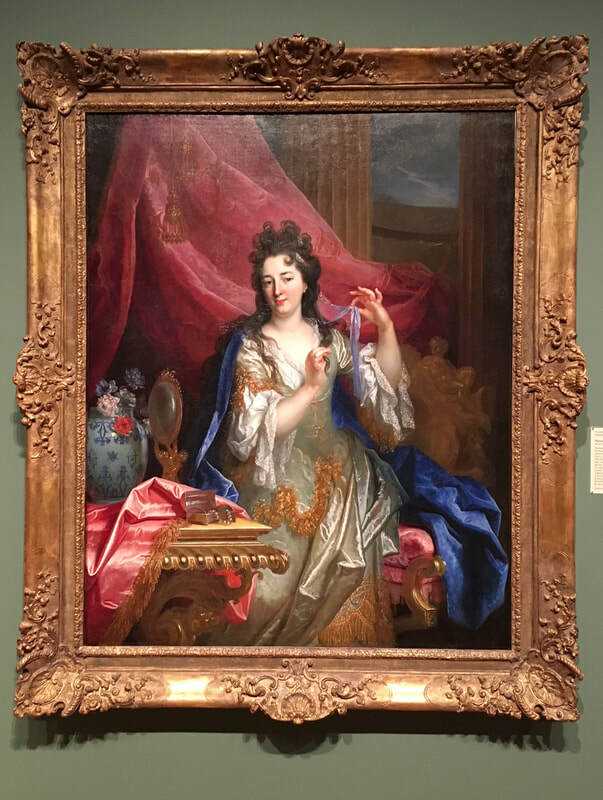 To sketch a masterwork, helps us all to really see it and maybe begin to think about all the decisions that the artist had to make in creating this painting, such as composition, lighting, how much of the sitter will be included and on and on. We moved on to a second amazing painting by Robert Henri. 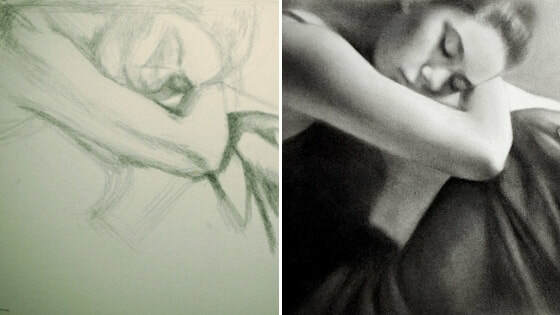 ​Again our emphasis was on sketching, and getting the overall strong direction or angle of the subject's figure. Then we moved on to creating large shapes to small shapes, with minimal detail. ​we relax and enjoy a luxurious lunch together! ​A super fun fantastic day was had by all!! What a great class! Fantastic finished work by my Portrait Drawing Class at OA Gallery! 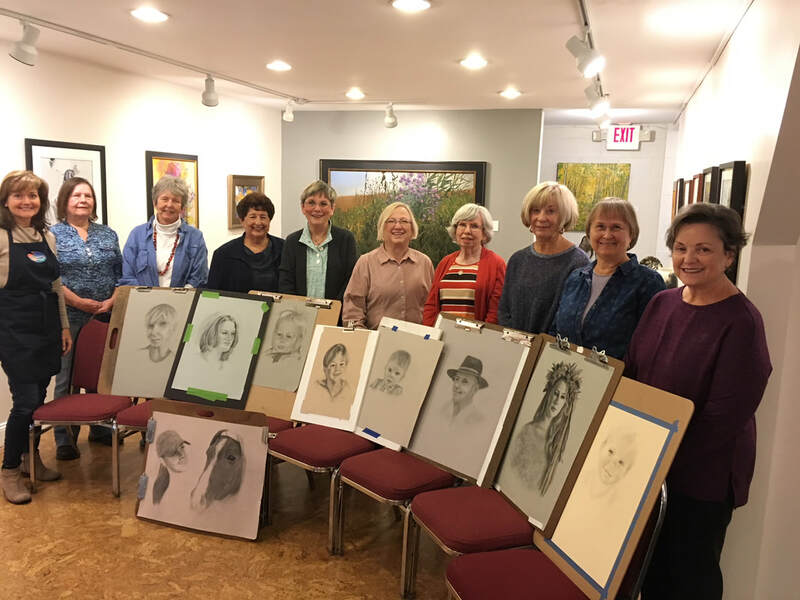 The focus of this portrait class was drawing the portrait on toned paper using graphite and charcoal. It's great for students to have a connection to their subject, so students are encouraged to bring their own photos. Demonstration Drawing where I begin by loosely laying in the large shapes of the head, face, hair and neckline and then I start the eye area. My art class students are working hard and making beautiful progress! What a great job they did! I have the best students! Thank you all for making it such a fun class!! 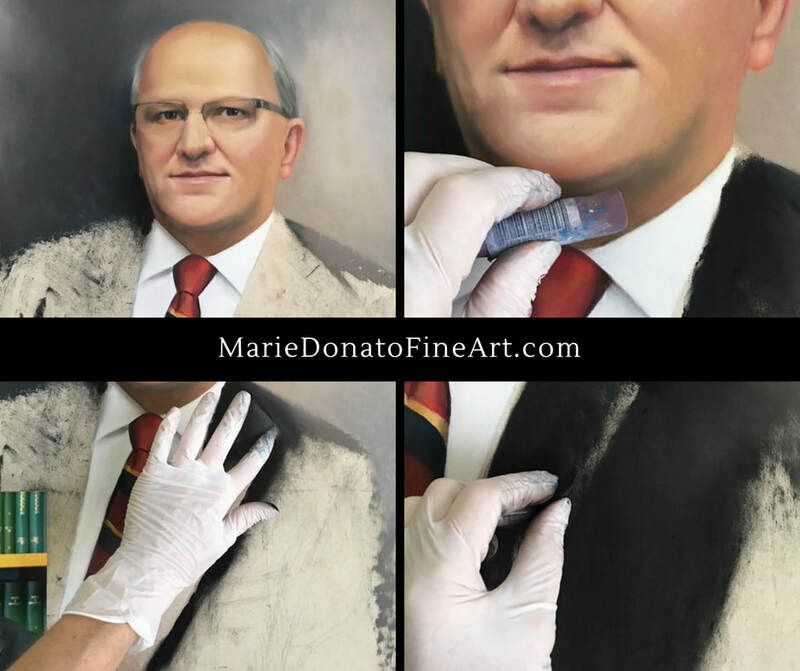 Here are photos of a corporate portrait painting created in pastel. To start a portrait there are many decisions to be made even before anything is started. Things like: how much of the figure will be included in the portrait, the background color, the subject's pose, clothing and overall composition. The first step is always drawing for me. I sketch my ideas out and work within the client's chosen size of the portrait. ​For this portrait commission I was asked to create an upper torso/head and shoulders portrait. I sketched my final drawing onto the sanded pastel board. When working on a pastel painting, I usually work top to bottom because of the fall of the pastel dust. It is much cleaner that way. To protect my hands from the abrasive texture of the sanded board and to keep them clean, I wear gloves. For the skin tones there are many layers and many additional colors added to create subtle nuances in the complexion. ​and for more information contact me here. I love to sing the praises of my students! Classes offered are Pastel Painting, Oil Painting and Drawing. ​Here are progress photos of student's work in pastel, oil and charcoal/pencil. Oil painting in progress. Gorgeous color! Here is a graphite & charcoal drawing getting some finishing touches. I am so proud of all my students! Wow! 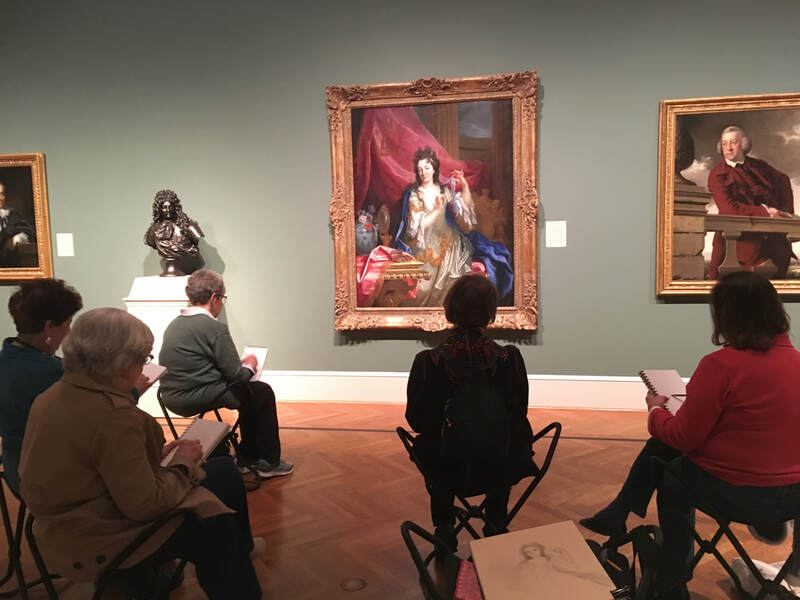 An art lesson at the Saint Louis Art Museum was a unique opportunity and treat for my drawing students! As an art teacher my hope is that my students have fun while learning! So I arranged a visit to the Prints and Drawings Study Room. Visiting the Study Room was a rare occasion to get a close look at Master work dating back to the 1700's! From there we went on to the main galleries to create sketches from two Zorn portraits. We all had a blast! 17 works on paper were chosen from the Art Museum's collection. Many of the works were unframed, matted only, and amazingly, not under glass. Magnifying glasses were supplied for closer inspection of the beautiful marks and details! ​was a pure delight to us all! We saw works from Ingres, Renoir, Childe Hassam, Berthe Morisot and others. Questions answered by the Study Room Manager, Heather Hughes, were so helpful! From the Study Room we sketched from the Anders Zorn portraits. We divided up between the Zorn portraits, Lucy Turner Joy and Halsey Cooley Ives. Mr Ives was the first director of the St. Louis Art Museum. To top it off we gathered for a delicious relaxing lunch at the Museum's Panorama Restaurant! As an art instructor, it is my hope to share my excitement for drawing and to create fun learning experiences for my students. We definitely will be visiting the museum again! check out my Art Classes page. ​Congratulations St. Louis Blues on an outstanding 2018/2019 season! The Blues have had such a fantastic winning season this year! It started off slowly, but they persevered and finished with 99 points to qualify for the playoffs and now they will go on to fight for the Stanley Cup! This season marks a special anniversary for me as well. This year is my my 20th year working with the St. Louis Blues and having the honor to create portraits for the St. Louis Blues management and team. 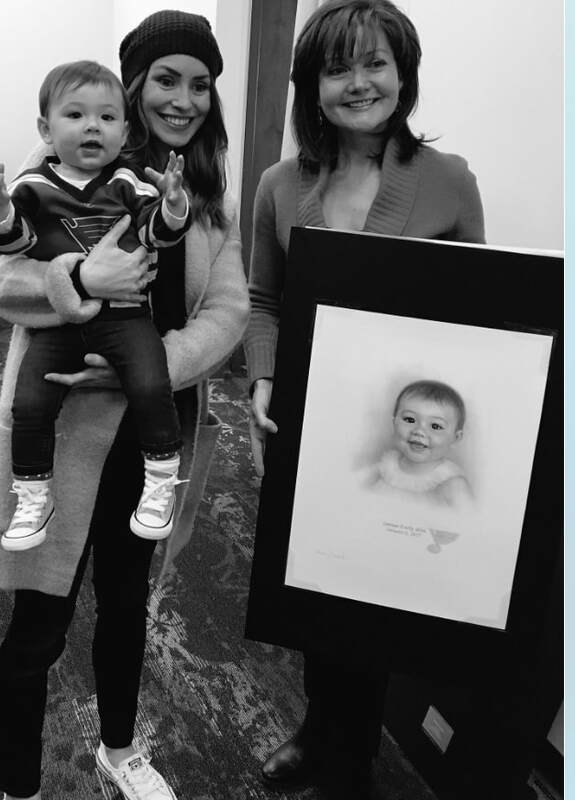 I am so honored to create artwork for the Blues! And I can't believe twenty years have gone by and so quickly! You know, my favorite part of being an artist is all the interesting and wonderful people that I have been blessed to meet! ​St. Louis Blues enjoy this amazing time! Go Blues!